Have you noticed a slightly new look for certain search results in SERP, it's because of Google announced a new schema markup type for all the visitors that those can be able to search on site within the search results itself. It will make it easier for site visitors to visit the direct specific content on your site with the help of this "sitelinks search box". Google has already announced a sitelinks search box. And that is why most of the blogger, WordPress users, website developers are looking for how to display the search box in sitelinks of Google search results. With lots of benefits are there in terms of SEO that making Google's job very easy in collecting site data to increase traffic. Many of you tried to add Google's sitelink box but still, the required google sitelinks search box not showing in their SERP. Here we are going to see how to implement Google's Sitelinks Search Box in Blogger or any website by using schema.org markup. Here is a step-by-step guide to enable or get the sitelinks search box in SERP. It's one of the advanced blogging tips help you learn how to show Google's sitelinks search box for your any website or blogger blog and increase Google web traffic. For better SEO last time you have seen How To Get Star Rating Review In Google Search Results [SERP] | Install Review and Rating System, while we also seen [Guide] Breadcrumbs & SEO [What, Why & How] ✅ | Do We Require SEO Breadcrumbs Navigation. 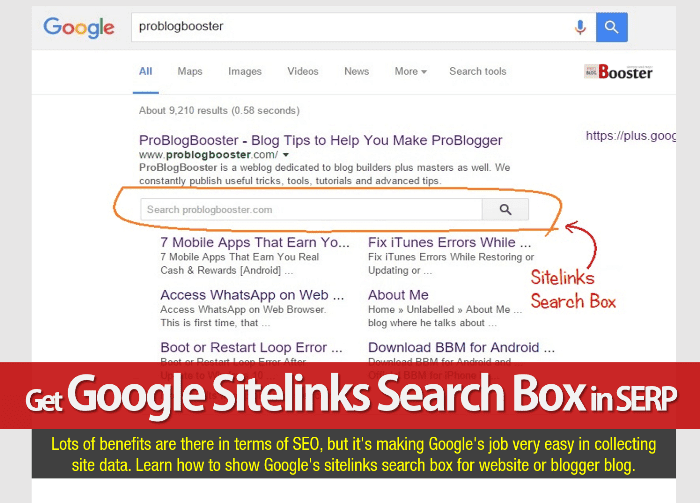 But today we are going to see a new and advanced blogging tip on getting sitelinks search box to increase website traffic. Creating a website on Google blogging platform is once easy but getting targetted but organic visits is one of the hard tasks. But sitelink search box is the best option to improve the traffic to the site as it directly transfers all the visitors to your own search results instead of other Google pages that showing ads coming from 3rd party sites. One can only see 'search box' in search results if he/she searches for your brand name. If he/she is aware of your brand, chances are high that he/she will directly land to your website without searching it over Google. As a result of this, you would get more clicks and more visits, and that will help to get better control over the site navigation. It's possible the sitelinks search box - like other SERP features - can increases CTR for sites that it displays for. This could be an advantage if competitors are bidding on your brand name - and can help you earn those 1st pass clicks, even if users don't use the search box. How to display my website in google search results with Sitelinks Search Box? - To implement this feature on your site or blog, your website must have a working SearchAction markup (shown below). The sitelinks search box (schema.org/SearchAction) is one of the most popular markups out there. Once you installed related markup, the webmasters (now search console) can use schema.org from your index page. This markup uses, the property of "@type" to define your site type. Moreover, the property of "url" used to use your site URL of the site going to be searched. The "potentialAction" & "target" properties are used for supported action a user might take on targeted URL. Step 1: Go to your HTML section of your site. Step 3: Save the template and wait for Google to crawl your site. By default, searches performed in the sitelinks box sends users to the second set of Google results, refined to include to results from the target website. The second page also typically includes additional Google ads, giving the searcher a chance to click on an ad instead of visiting your website. And this is the reason why major websites like Microsoft, Facebook, Amazon does not have it. If you can get more traffic without losing anything, then why not implement this in our site? I would like to tell you the interesting part about SearchAction is can be seen in a branded search page; your brand stands out more qualified & your brand gonna rank high enough in any case. So have implemented the code for Google's sitelinks search box and share your experience with us.